I can't really give a proper explanation for my intense passion for tacos. It was a love affair that was destined from the very beginning. Well, not really. I was a quesadilla kid. Oozy gooey cheese stuffed into a flour tortilla? Nothing made me happier. Until I ventured into the taco world. What is it about the moist and tender spiced meats and zingy salsa, sometimes layered with good ole guac if I'm really having a stuff-my-face-with-avocado kind of day (side note, for me, that's every day...), complete with the delicate green cilantro leaves laying happily on top....that's it. I know what it is. It's the perfect combination of flavors and textures that make tacos so irresistible. Maybe you're a flour tortilla person. I'm not. No judgement on those who are! I'm just a corn tortilla lover. It might be my quiet aversion to wheat, but really, whatever medium you choose to get those taco fillings in your mouth is a-ok by me. It all goes to the same place. So, being that it was just recently Cinco de Mayo (thank you to the Mexican army for their unlikely victory over Napoleon III's forces at the Battle of Puebla, circa 1862...this margarita's for you! ), I spent the morning of May 5th dancing around the kitchen in celebration of the magic flavors and rich culture of Mexico. And trying my hand at creating a version of huevos rancheros, a traditional mid-morning meal originating on rural Mexican farms. Basically, a heavenly breakfast taco. The basics: fried eggs on fried corn tortillas (fry anything in butter, I'll eat it and I will smile a happy butter-induced, slightly delirious smile), drizzled with tomato-chile salsa. Some traditional accompaniments are guac, Mexican rice and refried beans. Or if you're a Tex-Mex fan, throw in some cheese and sour cream...we Americans love our cheese and sour cream. Yes, yes, you could even use a wheat tortilla. 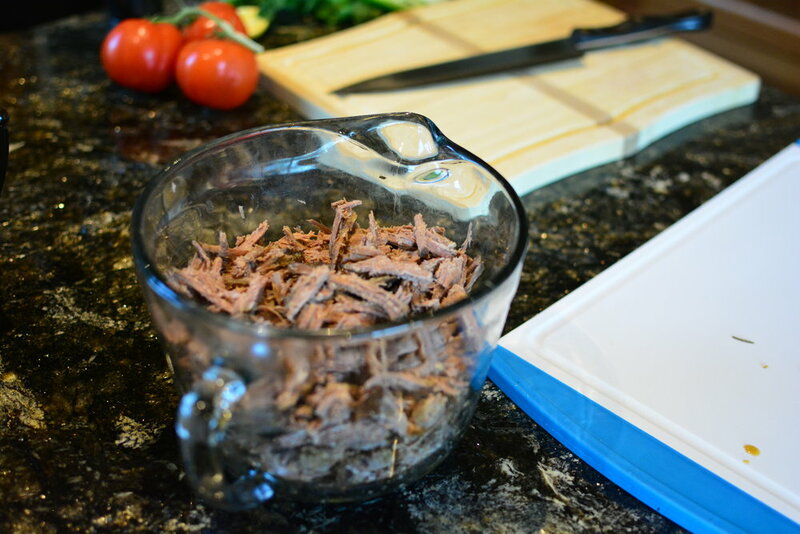 I have a love affair with Jamie Oliver, and followed the Brit's own version of the recipe that I found here. He swears it's the ultimate hangover cure....so really, no need to hold back on those tequila shots knowing you've got this delight waiting for you to cook up in the morning. 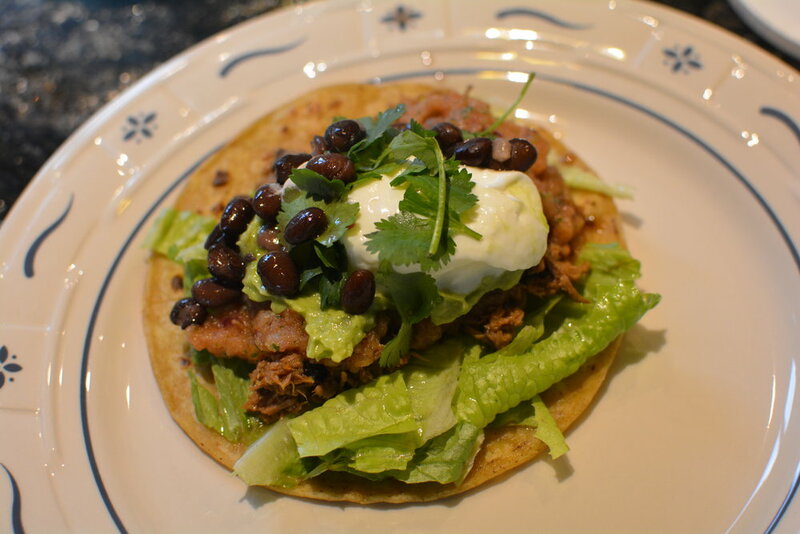 I made mine with some black beans and added a dash of cayenne pepper. Life's nothing if not better with a little spice, right? Oh, and I may or may not have left out the chorizo. It's just as good as a veg option! After everything was all prepped (salsa blended, avocados sliced, plain full-fat greek yogurt dragged out of the fridge in lieu of sour cream, fried eggs sizzling in the pan and tortillas hot and slightly crisp in their butter-induced coma), I assembled these little beauties. 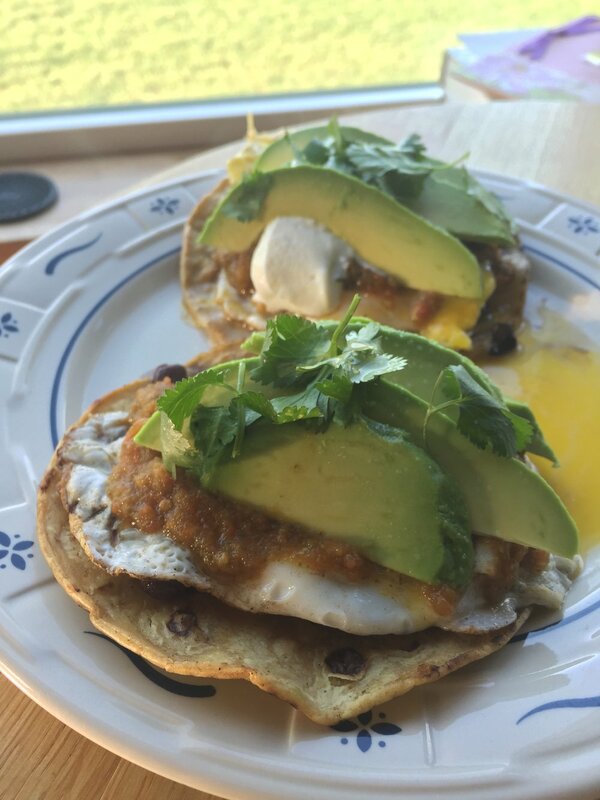 Tortilla + beans + egg + salsa + avo + yogurt + cilantro. Oops, forgot the = Lauren's happiness. Then I ate them. Happy Cinco de Mayo, indeed. And then my dad was mad when I sent him pictures and he wasn't at home to have any of the amazingness that was my huevos rancheros. So, come May 6th, I decided that there is no such thing as over-celebrating Mexico's victory over the French. Let it be Taco Round 2 of the week, this time based off of some leftover slow-cooked shredded beef. Wasn't hard for my taco-minded brain to come up with the fabulous idea of beef tacos...we based it off of this Food Network recipe. Man, that was some tender beef. And again, shout out to Mexican cuisine for its outstanding marriage of taste and texture, and my mouth for its agreement to be a constant venue for the wedding. We whipped up some salsa and guac, heated up some leftover black beans from the huevos rancheros of yesterday morning, and sang some mariachi songs while drinking tequila from the bottle. And yep. There was that taco-induced happiness making my mind spin around in a dizzy blur. For my fellow taco lovers out there...let us remember that the glory of Cinco de Mayo can be any night of the year, if we are only brave enough to submit to our inner taco passion. Me gustaría bailar desnuda para tacos.